After a record 17 nominations Meryl Streep has done it again! She has just won the Oscar for Best Actress, for her brilliant portrayal of the first female British Prime Minister, Margaret Thatcher, in The Iron Lady. Despite being nominated as many times as she has, this is only her third time winning, but not the first time she has walked away with the highest accolade for an actress in Hollywood, this being her 14th nomination for the Best Actress Oscar. She achieved the same feat exactly 30 years ago, when she won the award for Sophie’s Choice in 1982, but as they say, it is an honour just to be nominated, no? Meryl has always been criticised as being cold and far too technical of an actress, which we all saw to be utter nonsense in the warmth and life she showed in roles like the one in Mamma Mia!, also keeping in mind that the same people who have nominated her so many times in her career, are her own peers and rivals. So, to those critics, we collectively say, Bah Humbug!. Let me add that the difference between her and those in second place (for nominations that is) is huge, as Katherine Hepburn and Jack Nicholson have only been nominated a paltry 12 times in comparison. We say congratulations to Miss Streep and may we see many, many more of your brilliant creations. P.S. : I absolutely loved your delicious devilishness in The Devil Wears Prada! Categories: Entertainment | Tags: actress oscar, Best actress, british prime minister margaret thatcher, margaret thatcher, Meryl Streep, The Iron Lady | Permalink. Coming from the excitement of the SAG Awards and heading to the glory of the Oscars and the Grammys we decided to do a profile of one of the most prolific actresses of our time. 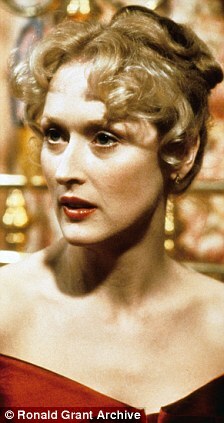 With a record 17th Oscar Nomination (for her role as Margaret Thatcher in “The Iron Lady”) under her belt, Meryl Streep is regarded, by both the industry and her peers, as one of the greatest living actresses. Diane Keaton once described her as “my generation’s genius” and her closest rivals for nominations are Katherine Hepburn and Jack Nicholson, who have 12 each. She has been described by her critics as too cold and technical, but who didn’t love her as the boss from hell in The Devil Wears Prada, or dance along to her (very warm) colourful character in Mamma Mia. She is without a doubt the most versatile actress of her time, having played a scorned wife, a Nazi concentration camp prisoner, a factory worker, a writer, a hobo, a dru addicted young actress, a teacher, an insane editor of a New York fashion magazine, a very strict nun and a British Prime Minister! Considering that its her peers (and rivals) who nominated her for all these Oscars, its strange that she’s only won twice (for Kramer vs Kramer and Sophie’s Choice). 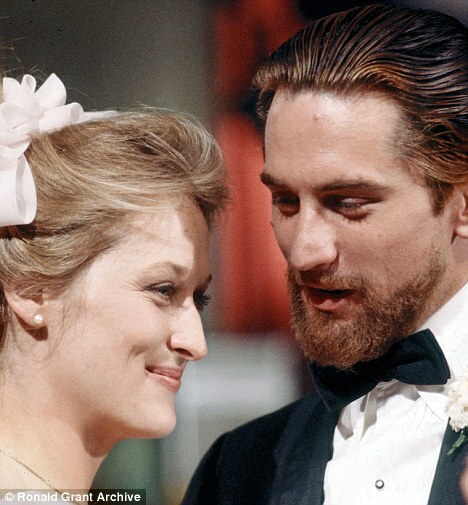 1979 – The Deer Hunter. This was her first Oscar nomination, for Best Supporting Actress, and only her second film. She starred alongside Robert De Niro and Christopher Walken and had a small role (in which she wrote her own script!). In the same year, she played a scorned wife in Kramer vs Kramer, alongside Dustin Hoffman (the cheating husband), for which she won her first Oscar, for Best Supporting Actress. 1981 – The French Lieutenant’s Woman. This performance as a 19th-Century English maiden in love with a French Lieutenant earned her one of her many nominations for Best Actress, and she showed her amazing gift for mastering accents. 1982 – Sophie’s Choice. For this heart-rending performance, she won her first Best Actress Oscar, for her role as a Polish mother (with impeccable accent) in a Nazi concentration camp, who has to decide which of her children to sacrifice. 1985 – Out of Africa. This time she was a Danish writer (another accent) having a love affair in Kenya, with Robert Redford’s character, the big-game hunter. 1987 – Ironweed. 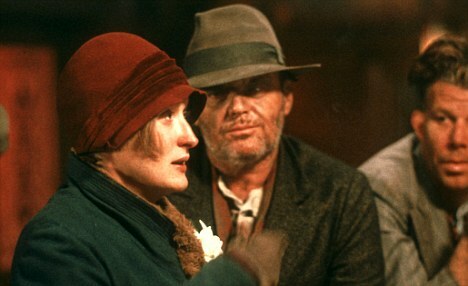 Meryl shows, once more, her versatility, as she plays (alongside Jack Nicholson), a vagrant in Depression-era America. Her portrayal of a sad, muttering bag lady who is in shambles is quiet haunting. 1988 – A Cry In The Dark. One of her most well-known roles as Lindy Chamberlain, the Australian mother who was charged with murder after her baby was snatched by a dingo during a camping trip. 1995 – The Bridges of Madison County. Meryl was weepy in this one, where she plays a farmers wife in the sixties, having an affair with a photographer (Clint Eastwood. 1988 – One True Thing. Another deep performance as she portrays a mother dying of cancer, who is being taken care of by her daughter (Renee Zellweger). 1999 – Music of the Heart. Here she starts out bedraggles as an abandoned wife who somehow tranforms and becomes an inspirational violin teacher. 2002 — Adaptation. Meryl wows the audience as a writer who gets mixed up with the wrong people (among them, Nicholas Cage) and investigates orchid theft. Part thriller, part comedy, this was also her record breaking 13th nomination, and her third for Best Supporting Actress. 2006 – The Devil Wears Prada. Here she gives a brilliant performance as the monster of all bosses, editor of a New York fashion magazine, and she’s not only hilarious in her role, she dominates every scene…even those in which she’s just included over the phone. 2009 – Julie & Julia. Here she is funny and charming as American cookery writer, Julia Child, showing off her uncanny ability to impersonate almost anyone, down to perfection. 2011/2012 – The Iron Lady. 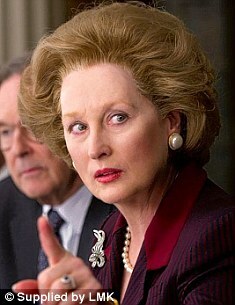 As Margaret Thatcher, the first female British Prime Minister (and the longest serving of the 20th Century), she earned her record 17th nomination for what we already knew would be a dazzling performance. Categories: Uncategorized | Tags: Awards, Best actress, best supporting actress, devil wears prada, kramer vs kramer, Meryl Streep, nazi concentration camp, new york fashion, nomination, Oscars, robert de niro, The Iron Lady | Permalink.